The Internet and digital technologies are transforming our world – in every walk of life and in every line of business. Europe must embrace the digital revolution and open up digital opportunities for people and businesses. How? By using the power of the EU’s Single Market. Today, the European Commission unveiled its detailed plans to create a Digital Single Market, thereby delivering on one of its top priorities. At present, barriers online mean citizens miss out on goods and services: only 15% shop online from another EU country; Internet companies and start-ups cannot take full advantage of growth opportunities online: only 7% of SMEs sell cross-border (see Factsheet for more figures). Finally, businesses and governments are not fully benefitting from digital tools. The aim of the Digital Single Market is to tear down regulatory walls and finally move from 28 national markets to a single one. A fully functional Digital Single Market could contribute €415 billion per year to our economy and create hundreds of thousands of new jobs. The Digital Single Market Strategy adopted today includes a set of targeted actions to be delivered by the end of next year (see Annex). 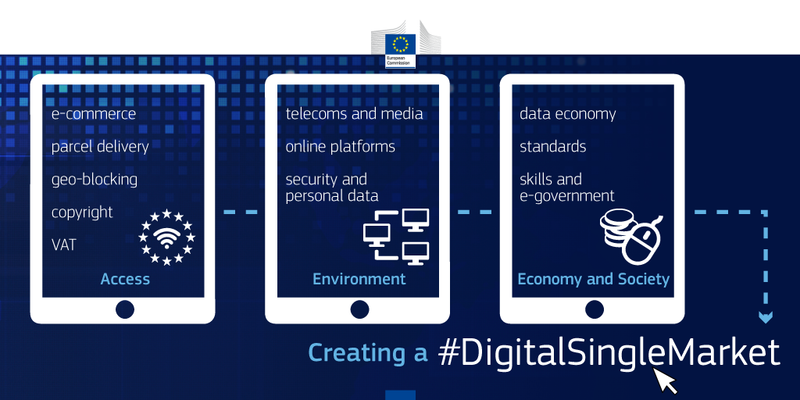 It is built on three pillars: (1) better access for consumers and businesses to digital goods and services across Europe; (2) creating the right conditions and a level playing field for digital networks and innovative services to flourish; (3) maximising the growth potential of the digital economy. 1. rules to make cross-border e-commerce easier. This includes harmonised EU rules on contracts and consumer protection when you buy online: whether it is physical goods like shoes or furniture; or digital content like e-books or apps. Consumers are set to benefit from a wider range of rights and offers, while businesses will more easily sell to other EU countries. This will boost confidence to shop and sell across borders (see Factsheet for facts & figures). 2. to enforce consumer rules more rapidly and consistently,by reviewing the Regulation on Consumer Protection Cooperation. 3. more efficient and affordable parcel delivery. Currently 62% of companies trying to sell online say that too-high parcel delivery costs are a barrier (see the newly released Eurobarometer on e-commerce). 4. to end unjustified geo-blocking – a discriminatory practice used for commercial reasons, when online sellers either deny consumers access to a website based on their location, or re-route them to a local store with different prices. Such blocking means that, for example, car rental customers in one particular Member State may end up paying more for an identical car rental in the same destination. 5. to identify potential competition concerns affecting European e-commerce markets. The Commission therefore launched today an antitrust competition inquiry into the e-commerce sector in the European Union (press release). 6. a modern, more European copyright law: legislative proposals will follow before the end of 2015 to reduce the differences between national copyright regimes and allow for wider online access to works across the EU, including through further harmonisation measures. The aim is to improve people’s access to cultural content online – thereby nurturing cultural diversity – while opening new opportunities for creators and the content industry. In particular, the Commission wants to ensure that users who buy films, music or articles at home can also enjoy them while travelling across Europe. The Commission will also look at the role of online intermediaries in relation to copyright-protected work. It will step up enforcement against commercial-scale infringements of intellectual property rights. 7. a review of the Satellite and Cable Directive to assess if its scope needs to be enlarged to broadcasters’ online transmissions and to explore how to boost cross-border access to broadcasters’ services in Europe. 8. to reduce the administrative burden businesses face from different VAT regimes: so that sellers of physical goods to other countries also benefit from single electronic registration and payment; and with a common VAT threshold to help smaller start-ups selling online. 9. present an ambitious overhaul of EU telecoms rules. This includes more effective spectrum coordination, and common EU-wide criteria for spectrum assignment at national level; creating incentives for investment in high-speed broadband; ensuring a level playing field for all market players, traditional and new; and creating an effective institutional framework. 10. review the audiovisual media framework to make it fit for the 21st century, focusing on the roles of the different market players in the promotion of European works (TV broadcasters, on-demand audiovisual service providers, etc.). It will as well look at how to adapt existing rules (the Audiovisual Media Services Directive) to new business models for content distribution. 11. comprehensively analyse the role of online platforms (search engines, social media, app stores, etc.) in the market. This will cover issues such as the non-transparency of search results and of pricing policies, how they use the information they acquire, relationships between platforms and suppliers and the promotion of their own services to the disadvantage of competitors – to the extent these are not already covered by competition law. It will also look into how to best tackle illegal content on the Internet. 12. reinforce trust and security in digital services, notably concerning the handling of personal data. Building on the new EU data protection rules, due to be adopted by the end of 2015, the Commission will review the e-Privacy Directive. 13. propose a partnership with the industry on cybersecurity in the area of technologies and solutions for online network security. 14. propose a ‘European free flow of data initiative‘ topromote the free movement of data in the European Union. Sometimes new services are hampered by restrictions on where data is located or on data access – restrictions which often do not have anything to do with protecting personal data. This new initiative will tackle those restrictions and so encourage innovation. The Commission will also launch a European Cloud initiative covering certification of cloud services, the switching of cloud service providers and a “research cloud”. 15. define priorities for standards and interoperability in areas critical to the Digital Single Market, such as e-health, transport planning or energy (smart metering). 16. support an inclusive digital society where citizens have the right skills to seize the opportunities of the Internet and boost their chances of getting a job. A new e-government action plan will also connect business registers across Europe, ensure different national systems can work with each other, and ensure businesses and citizens only have to communicate their data once to public administrations, that means governments no longer making multiple requests for the same information when they can use the information they already have. This “only once” initiative will cut red tape and potentially save around €5 billion per year by 2017. The roll-out of e-procurement and interoperable e-signatures will be accelerated. 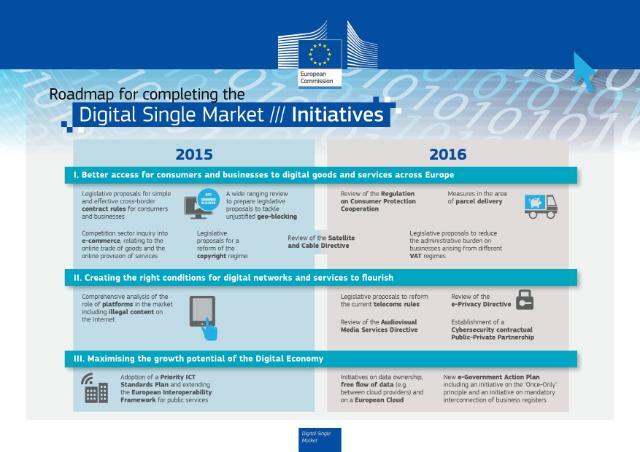 The Digital Single Market project team will deliver on these different actions by the end of 2016. With the backing of the European Parliament and the Council, the Digital Single Market should be completed as soon as possible. The Digital Single Market will be on the agenda of the European Council meeting on 25-26 June. With excellence in research, innovation, and application into economy and society, the new Centre of Excellence, Renewable materials and healthy environments research and innovation centre of excellence (InnoRenew CoE) will improve sustainable building practices by combining the existing concepts with the Restorative Environmental Design (RED) paradigm, which combines sustainable building practices with biophilic design. This will increase the competitive advantages of the affiliated renewable resource-based construction industry, and create innovation and market pull for RED-based materials and products (holistic living environment). Consequently, innovation and market pull for material recovery and higher added value renewable resource based and energy carriers will be initiated. Research and development activities will seek the optimal intersection of performance and sustainability, including economic, environmental and societal indicators. With support and guidance from the advanced partner, Fraunhofer WKI, scientific research and development activities will be transferred profitably and efficiently to the industry and through them to society in the form of innovative new products and processes. To create, improve, and communicate innovative products, processes, services, business models and systems for smart, sustainable and modern built environments for all generations, thus facilitating Slovenia’s transformation into a society focused on sustainability, cyclical economy, human well-being, and use of its renewable resources and assets. Scientific – increased resource efficiency, extended product life, and their influence on human health and well-being, improvements in product performance and functionality. Economy – innovative transformation of the renewable resource (especially forest products) industry to a competitive knowledge-based industry. Societal – Creating innovation encouraging and engaging environment (research and innovation culture) that will result in value-added products, processes and systems. The InnoRenew CoE will advance scientific excellence in Slovenia in wide range of fields related to renewable materials including: wood and material science, health, cultural heritage, business management, and ICT. Watch my keynote presentation delivered at WHD.global 2015 at Europa Park, Rust, Germany on Tuesday 24th of March, 2015. Question: What are you doing to align your business with the preferences of tomorrow’s digitally disrupted customers?